Are you heading back to school? Perhaps your child is heading off to college or just became a senior in high school. Which ever the case, one thing is for certain – you need an edge. 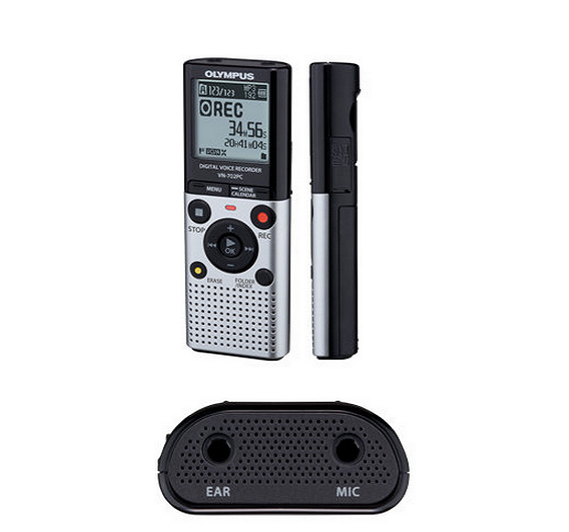 The Olympus VN-702PC Voice Recorder will give you or your student the edge they need. From high school science class to a lecture hall at Harvard, retaining information is key to success. The Olympus VN-720PC Recorder is top of the line, durable and rated 4.5 stars out of 5. The best recorder on the market according to college students who have used it. Included is 2GB of internal memory allowing up to 823 hours of record time — plus you can easily expand the memory by using the micro SD card slot. USB connectivity makes moving files from the recorder to your PC a breeze. The Olympus records in MP3 and WMA format for easy playback on any device. Hands free voice start and stop, built in kickstand, large LCD screen and calendar function to recall recordings from previous dates all provides the user with super functionality and usability. Don’t wait! Get this high quality and easy to use Olympus VN-702PC Voice Recorder at a bargain sale price today.